Residents of North American can grab Mega Man Legends 2 from PSN right now for a cool $9.99. The game is playable on PS3... but there appears to be an error on Vita and PSP. Trying to download the game on Vita results in the message "cannot download using this system." Uh-oh? Hopefully it's just a small hiccup that will be rectified soon. I'll keep an ear to the ground; more news on this soon. UPDATE 2: Vita works! All you need to do is buy it from your browser on PS3, then check your download list on Vita. Alternatively, try searching for MML2 from the Vita Store. Hope they fix the issue soon. I don't typically throw money at things I can't actually play.... even though to show Legends support I'd still have no regrets even if they didnt. I've installed it on the PSP through the PS3, purchased from the PlayStation Store on that system. No problems on my end, everything works as it should. Well, so far, anyway. I'll be sure to let you know if anything gets in the way of properly playing the game. You were able to transfer the PS3 game into PSP? What? People have been saying that they were unable to move the game to the Vita. Gah, Noooo been waiting for it on my Vita, really hope it comes out for it. I was able to download to PSP through PS3. I currently have no way of downloading it to my Vita. I have yet to test any version. I didn't notice it was PS3 only until the second I bought it. Which is a shame, since I really wanted to play this on my Vita. A post on reddit says transferring from PS3 to Vita doesn't seem to work with Legends 2, so that's out of the question. Let's hope the error gets fixed sooner than later. The is the same person that left the first comment. I can confirm that the issue is resolved for vita. You can either purchase through the psn via ps3 and use the download list on the vita, purchase via the psn app or website using PC or now search for it on the ps store on the vita itself (which was not an option this morning during my initial attemps) Bottom line, it's fixed across the board. Cheers everyone and dive on in! This is totally rad! 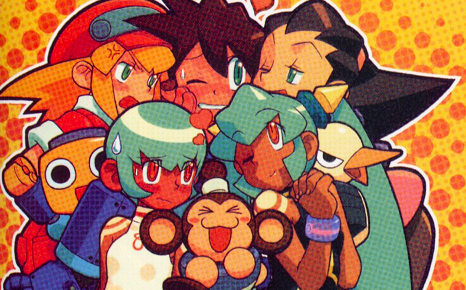 Now you can play the entire Mega Man Legends series on the go. ...in English! ...legally! Not to mention you can play them on a TV if you want, too. And all three games put together only cost $26. My only complaint is the back touch bar for r3 targeting. My fingers are just big enough to make it a pain lol.